As summer sadly draws to an end, some may start thinking of tackling projects inside the home, since soon, again sadly, that's where we'll be spending most of our time once again. While Under Foot specializes in providing clients with the supply and installation of superior flooring and wall products, we can also provide the do-it-yourselfers with a great selection of various floating and loose-lay products, along with any needed expertise to help them complete their projects with ease. Here you have the opportunity to see all the products at your disposal, discuss any concerns, and gain any needed knowledge or confidence from a company that's been at it for 25 years and counting. For most products we can have them ready for pick-up within a couple days, which might not be the instant gratification achieved with the big box stores, but our customer care is incomparable, and you'll feel great supporting a smaller, local, family owned and operated company, right? Pop on in and see what we're all about for yourself; can't wait to meet you! Laminate Focal Walls--very do-able and very affordable! 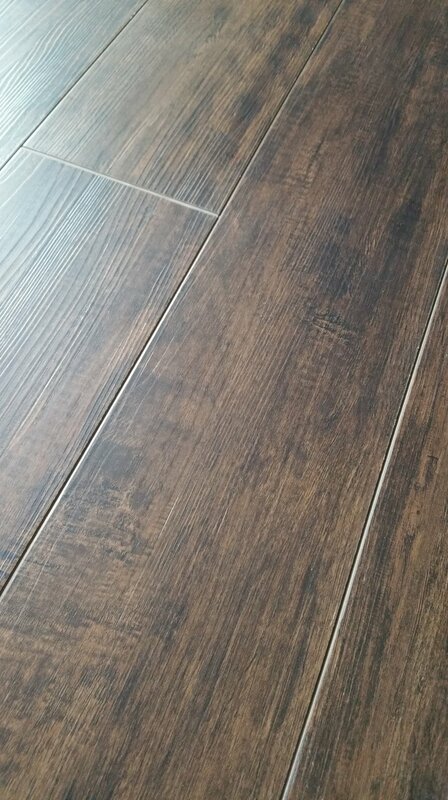 We were lucky enough to score an amazing product before many of our neighbours in the biz, and what makes this product so amazing is that it's one of the first of its kind: a floating luxury vinyl tile and plank with a grout line incorporated into each piece of flooring, so no more fooling around with little strips or messy grouts. There are two grout widths to choose from, and the wood planks provide very convincing porcelain wood-look tile visuals. These products are all 100% waterproof thanks to their composition and DropLoc technology, and ease of installation is something any DIYer can get behind. Visit www.quickstyle.com/true-grout for more details, and in the meantime, enjoy some close-ups! So it's been a while since we added an item of interest! It's almost like winter never happened...and now it's gorgeous outside once again. 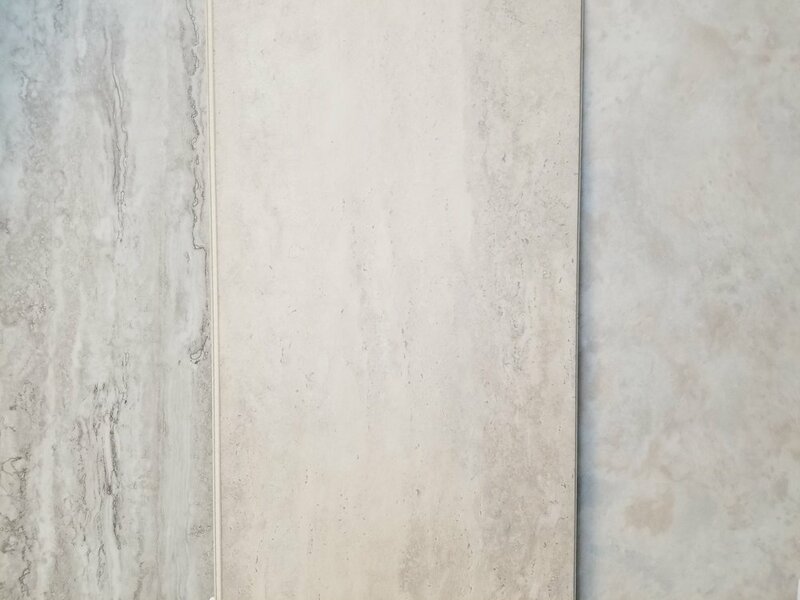 We're thinking of how best to enjoy our outdoor spaces right about now, and what better way than by adding some extra oomph to our porches, patios, balconies or boring concrete slabs with a gorgeous colour-body porcelain tile. Wood-look tiles can add warmth, texture and amazing visuals while stone-looks add sophistication and elegance. When installed well with the proper water-proofing techniques applied if necessary, colour-body porcelain can easily withstand our crazy Canadian climates, and adds amazing interest to your exterior all year round. So if your outdoor-enjoyment spaces could use a little sprucing up, by all means give us a holler. A gorgeous linear large format wood-look porcelain above and a stunning slate-look multi-size porcelain below, both courtesy of google images. Here you will find interesting little tidbits of information, as well as featured products and occasional specials. Please never hesitate to contact us with any questions or concerns you may have regarding your flooring, flooring in general, anticipated flooring; you get the idea. Our next level consultants and installers are always here to provide assistance. We can also help complete the picture with paint selection and design advice if needed. So if you're contemplating what to put underfoot, visit Under Foot and we'll help every step of the way.